to help you look cool , smell great and feel amazing wherever you go. Diffusing essential oils with a Terra Cotta Pendant is easy! Add one or two drops of essential oil onto the terracotta surface, allow it to absorb fully (couple minutes) and the fragrance will diffuse into your personal breathing space all day long! See the process in pictures here! We include a special Welcome Gift with your first order – our beautiful Sunshine Pendant! All you need to do to claim it is leave a note in the Cart, telling us how you found us – i.e. “I was searching on Google for…” or “A friend was wearing one” or “My upline/downline told me about them.” When we confirm that this is your first order we will add the Sunshine Pendant to your package no matter how many pendants you order! Join our Special Contacts List so you can hear about our Specials, updates and new product offerings. Get all the details here! 1. We have a minimum order policy of 3 pieces. 2. Our Guarantee: if you are not thrilled with your Terra Cotta Pendant product, simply return it for an exchange or a refund . Providing no oil has been applied to it. 3. Introductory Offer! Order between 3 and 6 units and receive 1 Free Sunshine Pendant ! Order between 7and 12 units and receive 2 Free Sunshine Pendants! Order between 13 and 19 units and receive 3 Free Sunshine Pendants ! 4. You can see the other shipping rates and Bonuses on this page. 5. You get the Wholesale price/bulk discount by adding 20+ units to the Shopping Cart. The discount will be calculated automatically. See details here! 6. 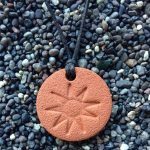 Terra Cotta Pendants are handcrafted in Canada. All prices are in Canadian dollars. The total will be converted to your currency if need be when it reaches your credit card centre. Contact me with any questions you have or check the Frequently Asked Questions page for more info about Terra Cotta Pendants and about ordering. Click on “Products” at the top of any page to see the different categories.